DO YOU WANT TO BE EQUIPPED TO EXPOSE THE DISTORTION OF BASIC BIBLICAL TRUTH IN THE POPULAR MEDIA TODAY? 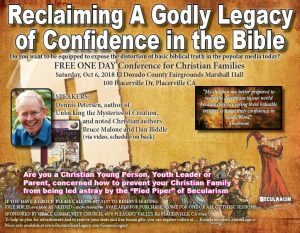 ARE YOU A CHRISTIAN YOUNG PERSON, YOUTH LEADER OR PARENT, CONCERNED HOW TO PREVENT YOUR CHRISTIAN FAMILY FROM BEING LED ASTRAY BY THE “PIED PIPER” OF SECULARISM? The so-called millennial generation and others are being overwhelmingly deceived by “high-sounding” ideologues of Secularism. It’s no secret that the world of news media and the big government business of education has the whole society subjected to their indoctrination. They even have many esteemed church leaders ‘charmed’ into thinking they can’t defend the Bible with intellectual honesty. With God’s help, this alarming situation will change… but only when fearless Champions of God’s INERRANT WORD take seriously the challenge to Renew their minds by testing the vain imaginations of those who willfully ignore the knowledge of God that the Creator has made evident for all to see. What do students learn when they patiently “test all things?” What do they see when they investigatively “speak to the earth?” What do they discover when they deliberately “ask the beasts” of the world? What amazing insights are gained when they “inquire of the former age” about the “world that then existed” before the Flood? Those are just some of the sweeping panoramas of discovery we’ll be exploring together at this historic local event. Why “historic?” Because those who attend will not soon forget the life-changing realities spotlighted at this one-of-a-kind event. A few weeks ago, a surprising event happened. Being a fairly energetic person, I never imagined it would happen to me at the young age of 71. I was awakened at 4 in the morning with what later proved to be a heart attack. When I finally got to the hospital after all the technology available was used to examine me, it was apparent that I had close to a 99% plaque blockage in the ‘widow-maker’ artery that supplies oxygen to two-thirds of the heart muscle. A painless and fairly non-invasive microscopic process was used to expand the blocked artery and insert a stent to allow life-giving blood to flow freely to all the heart. Apparently little damage was done. Other than slightly higher than normal blood pressure that’s being monitored with exercise and medication, the prognosis looks pretty good. But I’m reminded anew that every day of life is a gift from God. Four decades ago the Lord impressed me with the invitation of Psalm 66. “Come and see the Works of God. He is Awesome in His deeds for the children of men.” I’ve spent more than half my life dedicated to sharing the “wonderful works of God.” I’ve been honestly perplexed why more Christian leaders don’t take the command in Psalm 145 more seriously. “One generation SHALL praise Thy works to another and declare Thy mighty acts.” What an invitation to partner with the Lord of all creation to lead young learners in discovering God’s awesome demonstration of His power in the world around us. Now, I’m re-energized in my spirit to join the Psalmist’s prayer in Psalm 71. “O God, Thou hast taught me from my youth, and hitherto have I declared Thy wondrous works. Now also when I am old and gray headed, O God, forsake me not; until I have showed Thy strength unto this generation, and Thy power to everyone that is to come.” (verses 17-18). If you haven’t shown your family yet, wait until you see the compelling evidence that the animals that God calls “the Chief of the ways of God” actually were created right alongside with our grandfather Adam on this earth about 6,000 historical years ago. Some of the descendants of those ‘behemoths’ that we call dinosaurs actually survived the world covering Deluge of Noah’s time. Jesus staked His reputation on it. And it’s only because we’ve been blinded by traditional philosophies of vain deceit that our generation has been led astray by secular ‘pied pipers’ who are alienated from the life of God and darkened in their understanding (Ephesians 4:18). True forensic scientific research actually affirms the Bible and refutes the make-believe stories of evolutionary naturalism. Our first morning session on October 6th at the County fairgrounds in Placerville, will showcase vivid evidences that dinosaurs and mankind walked this earth at the same time. It’s time to reclaim God’s created giants of the animal world to glorify the Creator and stop letting our young ones think they are the mascot of God-less evolution. The two afternoon sessions will have a little help from two of my expert friends. Bruce Malone and Dan Biddle will join me (via video) to dismantle popular secular myths about origins and unpack some of the vivid visual evidences for Genesis creation and the World Wide Deluge. In our first presentation we’ll explore some of the remarkably effective connections for true seekers of truth. Showcasing highlights from my soon-to-be-released new book, we’ll break down for young learners a few of the 7 Persuasive Keys to the Awesome Works of God. Then, before dinner, we’ll look at some of the awesome evidences that are hardly ever seen in schools or museums about the miraculous creation and the overwhelming Great Flood of Noah’s time. Be sure to visit our event page at ReclaimYourLegacy.com/GenesisLegacy and check our Facebook page at ReclaimingYourLegacyRadioShow. And be sure to let me know when you attend that you heard about it here. I look forward to meeting you and sharing during our Q&A times after each of the four sessions on October 6th.